I am snob when it comes to falafels. I refuse to eat a bad falafel, even out of politeness. I just won’t touch it beyond the first bite. Unfortunately, I’ve yet to find good falafels here in Singapore. The texture is never quite right. A little too pasty, a little too dense. I suspect they’re using tinned chickpeas (gasp – how dare they!) in a food processor. So, Mangy caved in and bought the meat grinder attachment for the KitchenAid. It wasn’t difficult to persuade him, just some sweet talking and lots of promises to make more spaghetti and meatballs and he was sold. The grinder works much better than a food processor for falafels. You want the chickpeas in tiny tiny bits, but you don’t want a paste, which is what happens in a regular food processor. If you’re as serious (stupidly obsessed) as I am about falafels, the meat grinder is a worthwhile investment. Otherwise, use your food processor, but don’t over do it. Just a few quick pulses should be enough. Soak the chickpeas for about 10-12 hours in plenty of water. If you can, pour out the soaking water every couple of hours and add fresh water. After soaking, rinse well and drain. In the meat grinder (or food processor), add chickpeas, onion, herbs and garlic cloves. Add tahini paste, sesame seeds, cumin powder, coriander powder, red chili powder, salt, flour and baking powder. Mix well. Heat a pot with enough oil to deep fry falafels. Once the oil is medium hot, add a pinch of the falafel mix. Fry and taste for seasoning. Correct the seasoning in the mix as required. Portion the falafels out into even-sized ‘pucks’. I used a mini ice cream scoop to help with making uniformed sizes. 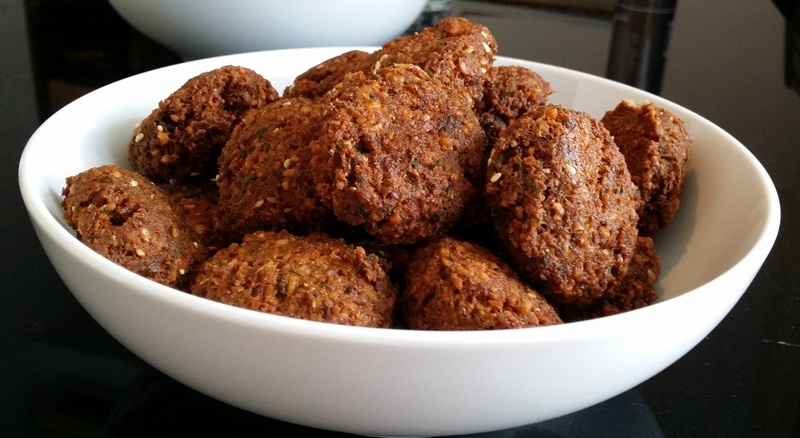 Fry falafels on a medium to low heat. You don’t want the oil too hot as the outside will burn before the inside gets cooked. I like my falafels a little darker than golden brown. Not burnt, but just a little more colour. I think it’s crunchier on the outside that way and the inside is cooked and soft and crumbly. Enjoy!